Bedding Information: 2 King. 1 Queen. 3 Twin. 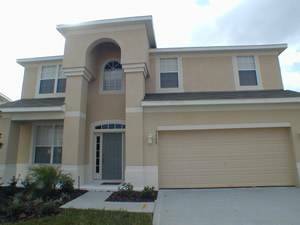 Windsor Hills is the most exclusive resort in Kissimmee! It's concept has been copied by rivals, but its still retains its premiere position. Managed by its owners, providing an abundance of family orientated facilities, it's like no other! Just look at what it has to offer!! *Shuttle Service to area attractions!! 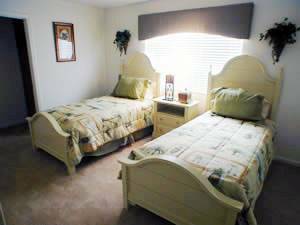 The spacious accommodation has been professionally decorated, and is air conditioned throughout with additional ceiling fans in every room. 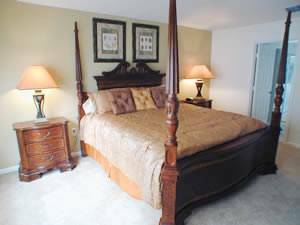 The master bedroom suite with king-size 4 poster bed, cable TV, walk-in-closets and ample drawer space has its own spacious ensuite bathroom complete with roman bath, walk-in-shower and his 'n' hers vanity units. A second bedroom suite with King bed, cable TV, built-in-wardrobes, drawer space, also has ensuite facilities of bath, shower and vanity unit. Bedrooms 3, 4 and 5 are all twin-bedded and are self-contained on the 2nd floor. Beautifully themed they will suit youngsters and teenagers. Both rooms have separate built-in-wardrobes and ample drawer space. The 6th bedroom has been designed to act as a separate suite (ie has its own adjoining provae bathroom) on the ground floor. It's ideal for elderly relatives or those wishing to be near the pool or in a quieter zone of the villa. 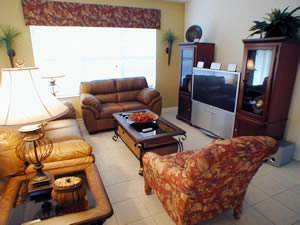 The relaxing family room has 50" cable TV, phone (free local calls), free high speed internet access, video, sound system, playstation II, and large leather comfortable sofas. A fully equipped kitchen incorporates a spacious dining nook and has every modern utility imaginable, including self-cleaning range (cooker), microwave, fridge-freezer with icemaker and dishwasher. 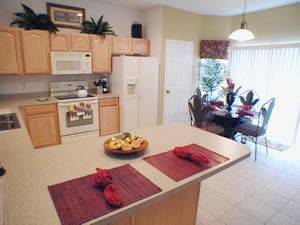 A walk-in-pantry provides additional food storage area, and a separate laundry room houses the automatic washing machine, tumble dryer and ironing facilities. 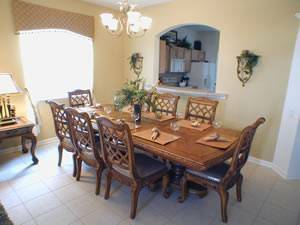 The beautiful dinning area seats 8-10 guests comfortably and is ideal for family gatherings. Absolutley perfect for special occasions! 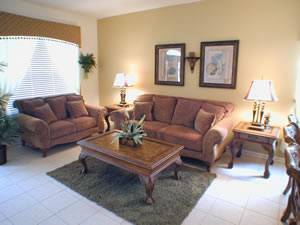 The separate and comfortable sitting area provides a most welcome respite for adults after a long day at the theme parks. The games room is the haven for all! The 8ft pool table, table tennis, darts and table soccer provide additional entertainment for all! Outside there is a beautifully shaped west-facing facing pool and spa which can both be illuminated at night for relaxing evening swims. Loungers on the sundeck will enable sun lovers to sunbathe, whilst the large lanai (porch), complete with additional dining furniture and easy chairs, provides shade for those who prefer. The whole area is enclosed by a fine mesh screen to enable you to enjoy entertaining and the pool late into the evening without having to worry about flying insects. The garden is fully irrigated with lawns and landscaping on all sides. Extras included free of charge: various children's videos and board games, high chair, crib, hair-dryer, towels and bed linen (excluding beach towels and cot linen). Rackets/balls/cues for all facilities at the clubhouse are also FOC. 5% discount for stays of more than 2wks. 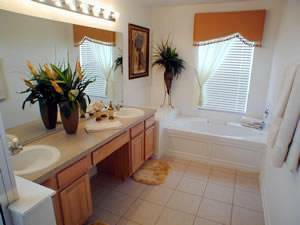 Pool/spa heating $175/week. Deposit: 20% deposit is non refundable. Balance due within 8 wks of holiday start.